As I have done my research, a ‘heuristic’ has developed in my mind. I have drawn inspiration from the determinants of wellbeing and health models – so familiar to me in my work. It’s worth having a quick look at the one by Barton and Grant to get the idea. Here is a link to the Google images search result. So in essence my research has been about the factors that constrain or enable systems thinking in partnership working for wellbeing and health. As I have said elsewhere I got a little annoyed at some public health research that seemed to imply an ‘absent competence’ model – the reason it isn’t happening is because leaders aren’t trained. This has parallels with the original purist ‘medical’ view of wellbeing and health – the reason you are unhealthy is because of your genes or physiology. The ‘prescription’ becomes training courses. The trap of reductionism. As I have read literature and carried out my research, I have started to think of the ‘factors’ as equivalent to the determinants of wellbeing and health. In the same way that everyone has a capacity for good health and positive wellbeing, everyone has systems thinking capabilities. In the same way that an individual’s health and wellbeing is shaped by economic and social forces around them, so an individual’s capacity to use systems thinking in wellbeing and health is shaped by practices or institutionalised social technologies within their direct workplace and wider policy making. This is the same for ‘leaders’ as it is for all other practitioners – their thinking and actions are shaped by those norms around them. I’ve also learned that ‘systems thinking in partnership working for wellbeing and health’ is not a one-size fits all. Sure there is a need for managing systemic change – especially with the need for social change to address the social and economic inequalities that result in health inequalities. But people also work in partnership to design service ‘systems’ – care pathways, patient journeys across hugely complex range of providers – these sort of things need different ways of using Systems to that social change agenda. As does crisis management. As does operational coordination. All these different types of ‘problematic situations’ have different levels of uncertainty, predictability, timescales, urgency and different degrees of multiple perspectives. We need to be able to embrace the lot. So taking inspiration from Barton and Grant I have developed a heuristic or device that others could use to explore similiar problematic situations (as part of a systemic inquiry). They may need to adapt it for their own setting. If it then helps to understand a situation it could lead to actions to improve it. For me, I really don’t think those actions are about ‘training’ per se but doing what I can to give people the opportunity to work in ways that draw out their systems thinking capabilities – particularly in my setting structured ways for social learning to happen. This is drawing out systems thinking through the experiences that people have on a day to day basis. Kind of like the ‘nudge’ idea – making the healthy choice the easier choice – we get making the systems thinking choice the easier choice! You can see the first iteration of the heuristic here I am sure I will keep iterating it so would love any comments or thoughts it provokes. As I have done my research, a 'heuristic' has developed in my mind. <span id="more-1081"></span> I have drawn inspiration from the determinants of wellbeing and health models - so familiar to me in my work. It's worth having a quick look at the one by Barton and Grant to get the idea. Here is a link to the <a title="opens google search result" href="https://www.google.com/search?q=barton+and+grant+image&amp;hl=en&amp;client=ubuntu&amp;hs=CCF&amp;channel=fs&amp;gl=uk&amp;prmd=imvnsb&amp;tbm=isch&amp;tbo=u&amp;source=univ&amp;sa=X&amp;ei=4flmT6unGMGX8QPkzuGpCA&amp;ved=0CCUQsAQ&amp;biw=1280&amp;bih=613" target="_blank">Google images search result</a>. 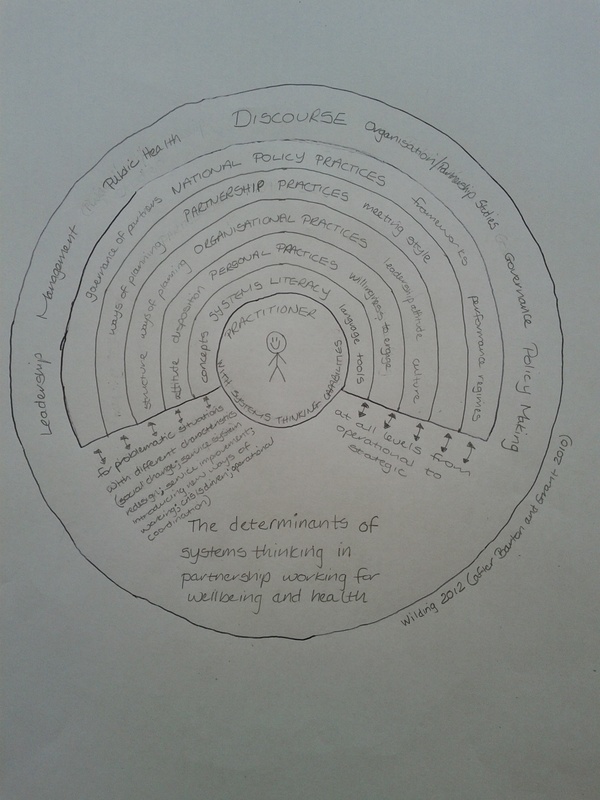 So in essence my research has been about the factors that constrain or enable systems thinking in partnership working for wellbeing and health. As I have said elsewhere I got a little annoyed at some public health research that seemed to imply an 'absent competence' model - the reason it isn't happening is because leaders aren't trained. This has parallels with the original purist 'medical' view of wellbeing and health - the reason you are unhealthy is because of your genes or physiology. The 'prescription' becomes training courses. The trap of reductionism. As I have read literature and carried out my research, I have started to think of the 'factors' as equivalent to the determinants of wellbeing and health. In the same way that everyone has a capacity for good health and positive wellbeing, everyone has systems thinking capabilities. In the same way that an individual's health and wellbeing is shaped by economic and social forces around them, so an individual's capacity to use systems thinking in wellbeing and health is shaped by practices or institutionalised social technologies within their direct workplace and wider policy making. This is the same for 'leaders' as it is for all other practitioners - their thinking and actions are shaped by those norms around them. I've also learned that 'systems thinking in partnership working for wellbeing and health' is not a one-size fits all. Sure there is a need for managing systemic change - especially with the need for social change to address the social and economic inequalities that result in health inequalities. But people also work in partnership to design service 'systems' - care pathways, patient journeys across hugely complex range of providers - these sort of things need different ways of using Systems to that social change agenda. As does crisis management. As does operational coordination. All these different types of 'problematic situations' have different levels of uncertainty, predictability, timescales, urgency and different degrees of multiple perspectives. We need to be able to embrace the lot. So taking inspiration from Barton and Grant I have developed a heuristic or device that others could use to explore similiar problematic situations (as part of a systemic inquiry). They may need to adapt it for their own setting. If it then helps to understand a situation it could lead to actions to improve it. For me, I really don't think those actions are about 'training' per se but doing what I can to give people the opportunity to work in ways that draw out their systems thinking capabilities - particularly in my setting structured ways for social learning to happen. This is drawing out systems thinking through the experiences that people have on a day to day basis. Kind of like the 'nudge' idea - making the healthy choice the easier choice - we get making the systems thinking choice the easier choice! You can see the first iteration of the heuristic <a title="opens image on a new webpage" href="http://helen.wilding.name/wp-content/uploads/2012/03/IMG_20120319_083640-r90.jpg" target="_blank">here</a> I am sure I will keep iterating it so would love any comments or thoughts it provokes.